“Nathaniel Fernandez Epstein, whom I believe to be unsurpassed among Filipino-Jewish-American candidates for Assessor in OC history, is the endorsed candidate of DPOC, so I can’t say anything bad about him. Happily, I don’t want to…What affects my endorsement is that the Assessor’s office has been an expensive cesspit for decades under Webster Guillory and now Claude Parrish (who promised investigation and reform and then snuffed it out), and the third candidate (Richard Ramirez) who has been working in the office for a long time, has not been clearly in the lead when it has come to publicly opposing the shenanigans. …Epstein is both qualified and unbought. Parrish isn’t. That warrants your vote…” – Greg Diamond. 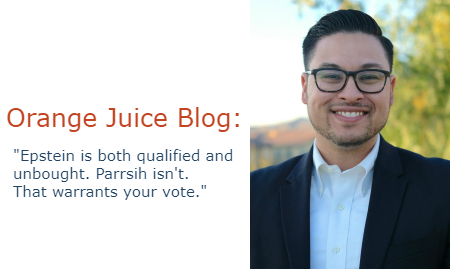 Thank you Orange Juice Blog and Greg Diamond for picking me as the next Orange County Assessor. I am looking forward to modernizing the current Assessor’s Office and connecting with the taxpayers and the employees within the Assessor’s Office to work together and make a more effective and efficient government body for the community.